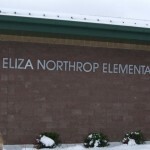 Eliza Northrop Elementary School, which opened in the fall of 2009, is named for the first teacher in the first school in Medina. Eliza Northrop was the daughter of a pioneer family who came to Medina County from Connecticut, and she taught for one year, 1817-1818, in a small log cabin about one mile east of Medina. The New England Yankees, who settled in the Western Reserve revered education. Once the log cabins were built to provide basic shelter for the pioneer families, schools were begun and carried on as a labor of love. 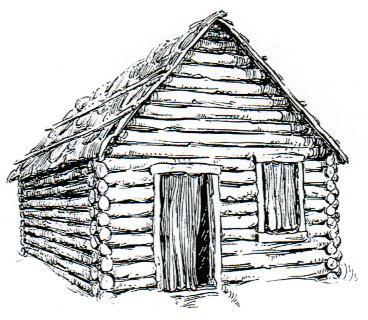 This particular log cabin, located near the farm of Chauncey Blakeslee, also served as St. Paul’s Episcopal Church, the Congregational Church and the town hall. The children came eagerly to these log cabin schools whenever they could be spared from work on the family homestead. According to the “1881 History of Medina County”, they walked long distances in all kinds of weather on trails blazed through woods — sometimes without warm clothing and frequently, without shoes. Seating inside these early schoolhouses consisted of crude benches made of logs split in half. Textbooks were few. The Bible was used for reading lessons. Perhaps a copy of “Webster’s Speller” might be available. Math instruction consisted of lessons in “figuring” from “Pike’s” or “Smiley’s” arithmetic books. Since public funding for schools was non-existent in the pioneer era, pupils were assessed a fee which went toward the teacher’s salary. However, frequently some families did not have the money and the teachers were compelled to wait for their wages. That first little school lasted only one year. The cabin burned down, and Miss Northrop married her beau, Silas Barnes, and gave up teaching. 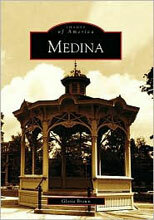 Here is a list of students in Medina’s first school: George, Lucius, Carlos and Lester Barnes; Frank and Philander Calender; Jared and Mary Doan; Joseph, Ruth, Elizabeth and Mary Hamilton; Clement and Freeman Marsh; Lois and Luisa Palmer; Anna, Cynthia, Philemon, Chloe, Ruth and Madison Rice, Banner and Harrison Seymour.